On the 10th of April, Practical Androgyny joined 8 other groups in helping to launch a campaign asking the candidates in this week’s UK general election to pledge to support nonbinary rights. At 10am today (2nd of May) that campaign reached the impressive milestone of securing pledges from more than 700 of the election candidates, across 40 political parties! At the time of writing there have been 702 pledges in total, 17% of all candidates standing for election. Of those the largest share is from the Green Party with 271 pledges, 289 including Scottish and Northern Irish Greens. That accounts for half of all Green Party candidates and includes the party leader Natalie Bennett. The next highest share comes from the Liberal Democrats with 153 pledges representing 24% of their candidates. In third place is Labour with 80 pledges, 12% of their candidates. Of the geographically-specific parties, the best performers are Alliance Party of Northern Ireland with 61% of their candidates pledging, Plaid Cymru with 52% of their candidates, and the Scottish National Party with 11%. Notable smaller parties with a large share of their candidates taking the pledge are 83% of the Pirate Party candidates and 40% of the Trade Unionist and Socialist Coalition party candidates. 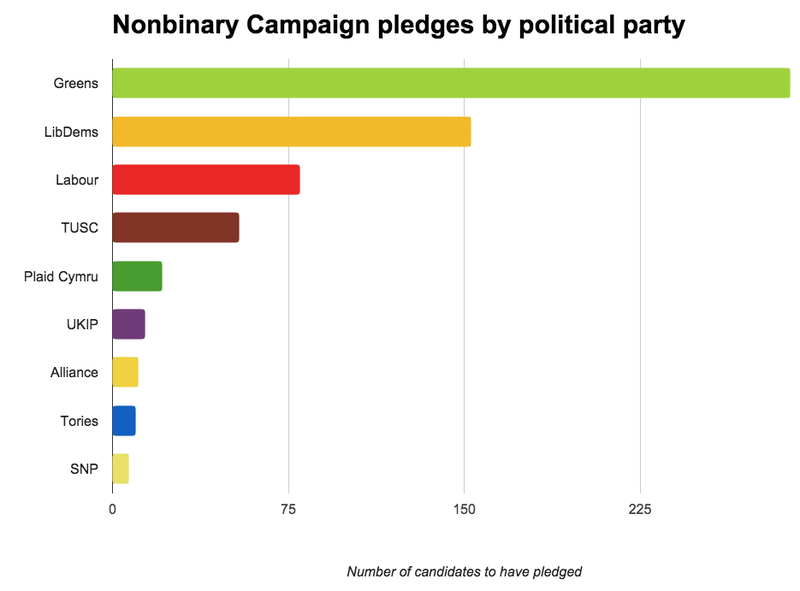 By contrast only 14 or 2% of UKIP’s candidates have pledged to support the rights of nonbinary people in the UK, and only 10 or a tiny 1% of the Conservative Party candidates supported the pledge. A full breakdown of pledges made by each party can be read on the UK Trans Info campaign site, as can a full list of all the individual pledges. Although the election is on Thursday, there’s still time to contact your candidates to ask them to pledge. If you’ve already asked by email, a follow up message over Twitter or other social networks may still help. Mentioning the 700+ existing pledges might lead them to take the campaign more seriously. The campaign site allows you to enter your postcode or constituency to see which of the candidates in your area have yet to pledge, along with their contact details. If this campaign is important to you, please consider taking the time to tell the candidates in your area. Edited 23:15: Updated the second chart to correct the labels that were erroneously implying that it was showing percentage of total party members rather than total party election candidates. My apologies for any confusion this may have caused. Update 23:00 on 2015-05-06: I’ve posted updated version of these charts on Tumblr showing the breakdown as 782 candidates had taken the pledge, that’s almost 20% of all candidates. Thanks to UK Trans Info for doing such a fantastic job of organising and keeping the momentum going on this campaign. 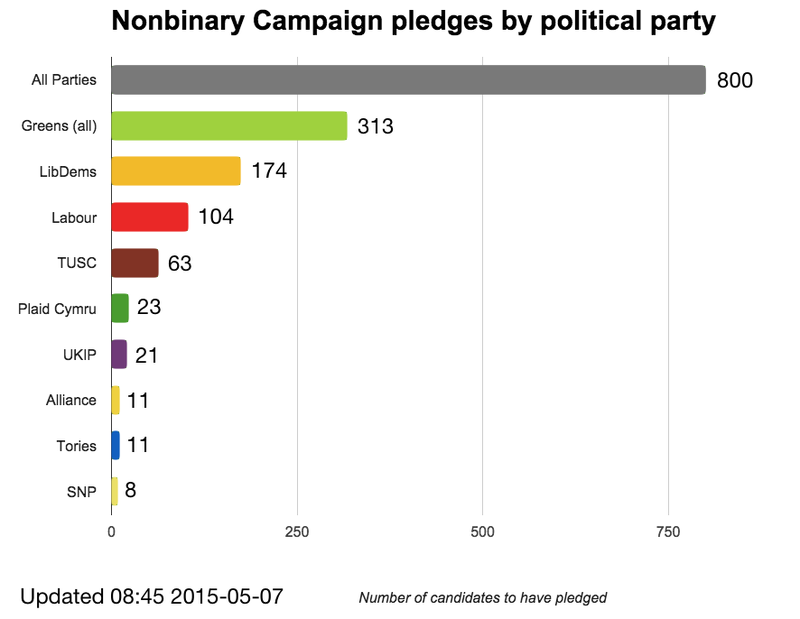 Update 9:00 on 2015-05-07: It’s election day and the campaign reached 800 total pledges in support of nonbinary rights and recognition at around 8:45am, that’s over 20% of call candidates! Pledges are still coming in and can be made until 10pm tonight.